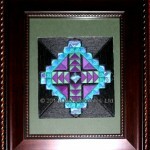 This design is called Frosty Pane Window and is from the Canadian website Northern Pine Designs. Design is to suggest Jack Frost on a window pane. 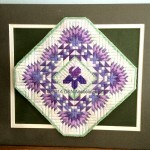 Iris and Fans, a counted canvas needlework piece, is sold under Nancy Needle’s and are design by Nancy Buhl. 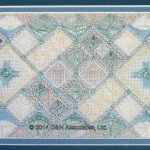 Blue Hydrangea is a design in the Regional Quilt Series from Nancy Buhl. Design called for 28 count linen, I used 32 count. 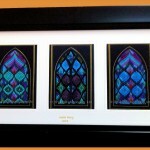 This design is called Stained Glass Window Card 2 and is from the Canadian website Northern Pine Designs. Linda Lachance is the designer. 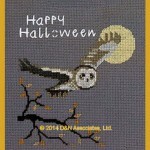 I purchased this pattern and the cut-out cards from the website. 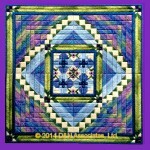 This design is called Geometric II and is a free 6.5 inch square pattern from the Canadian website Northern Pine Designs. Linda Lachance is the designer. 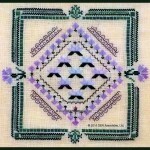 Worked on a 24 count banded linen that I purchased from the Nordic Needle website. 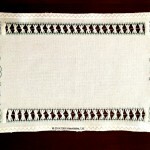 This banded linen is white on white and is 4 7/8 inches wide. 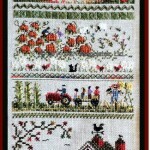 This is the third or fourth Victoria Sampler pattern that I have stitched. I like working their patterns, instructions are very concise. 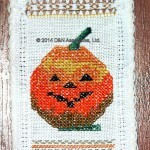 Design for this worked piece came from Heirloom Whitework Sampler – Linda Driskell Hardanger Pulled Thread Book.